When you're looking to hunt larger game, choosing the right projectile caliber and type can be a challenge. Furthermore, many companies want to take you for a ride with a variety of fancy, over-the-top and expensive designer bullets. 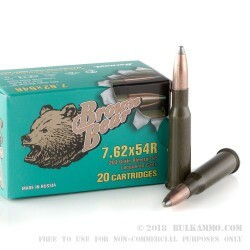 Brown Bear takes us back to basics with its 7.62x54r 203 grain Soft-Point cartridge. 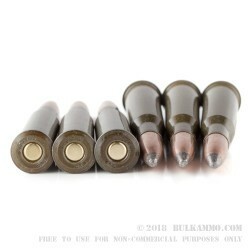 Its steel cases keep the cost of ammo down, and its Soft-Point jacket design expands on impact for maximum cavitation and a higher likelihood of a kill on the first hit. No frills, no added expenses. Much influenced by its Russian roots, Brown Bear cartridges offer raw power in its truest form. 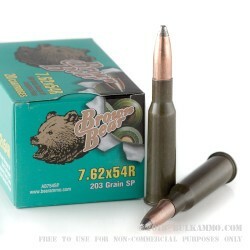 These Brown Bear 7.62x54r cartridges fire a 203 grain Soft-Point bullet at 2,306 feet per second. They produce 2,397 foot pounds of energy at the muzzle. Their Berdan-Primed steel cases are not reusable. 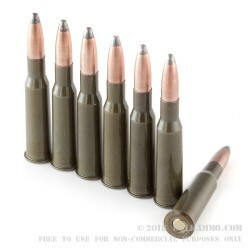 The ammo comes packaged in cardboard boxes containing paper "bricks" of ammo, each stamped and containing 20 rounds. This case includes 25 boxes of ammo.